A couple years back, I tried floatation tanks for the first time. Before making the decision to take the plunge, I set aside time to check out the potential benefits. I was most excited about the opportunity to experience complete sensory deprivation. Because the water temperature is the same as our skin and you're laying in total darkness, you are free for all external stimulation. This (hopefully) results in the perfect environment to create the ultimate meditative state. Which allows us to quiet the mind for creative problem-solving or visualization. Sensory deprivation is awesome. But last night, I created a different type sensory experience that was far more powerful. Since it was the last day of 2017, I decided to commemorate the transition into the new year. But, instead of going out, I stayed in an created what I termed as a "sensory enhancement experience." Whenever they talk about powerful visualization, they always suggest that we engage all of our senses. We have to feel as if the experience is real by activating "feel good feelings. I have a hard time visualizing in a way that creates meaningful feelings. It sometimes feels like an exercise rather than an experience. Like the float tank, I felt it was best to create the experience in water to promote total relaxation. 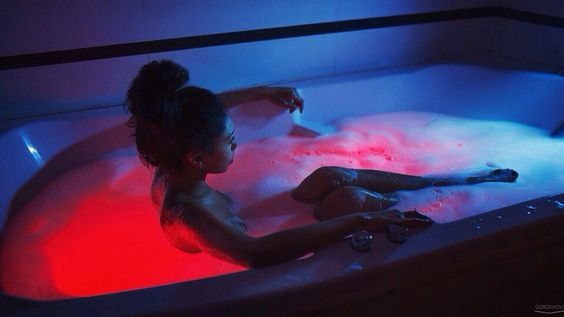 I mean, what's more relaxing than a bath? Also, by visualizing in the tub, I'm likely to extend the duration of the experience rather than sitting down for 15 minutes trying to meditate. As the bath water ran, I decided to include various elements to further heighten the senses. First I turned off the lights and lit a candle, but not just any candle. I have a collection of pleasant-smelling candles, but only a few of them actually makes me feel good every time I inhale the scent. If you try to recreate this mood, go for a candle that truly energizes you. Another thing I did was to spray the shower walls with a diluted mixture of essential oils to further enhance the experience. Next, I turned my focus towards creating the right auditory environment. For this experience, I chose to play a collection of music that have the ability to stir up positive feelings from deep within. We all have those songs that truly ignite sensations of joy and elation. If you don't have a playlist that creates that type of emotion, you may want to create one just for this. The music was critical for me to fully immerse myself in the experience. Don't skip this step. Adding a glass of wine doesn't hurt. Once the scene was set, I was able to fully relax and quickly begin to enjoy the process. It felt unlike any other meditation I've ever experienced. The images formulated in my mind quickly and easily. They were greatly enhanced thanks to the stimulation of all the senses. By the time the experience was completed, I was fully energized and ready to manifest all the visions I saw while in the bath. I made a promise to myself that this would become a 2018 ritual. This visualization process far exceeds the traditional methods without the added sensory experience. There is no comparison. I know that traditional meditation promotes the removal of distractions that stimulate the senses, but this technique works well for visualizing desired outcomes in a powerful way that promotes intense feelings of having already experienced what you want. Beyond the meditative benefits, I want my manifestation bath to produce wonderful beauty benefits as well. The plan is to incorporate various beauty boosters that I can add to the bath to produce glowing/amazing skin. Will discuss what I find in an upcoming article. Try this experience for yourself and be amazed.